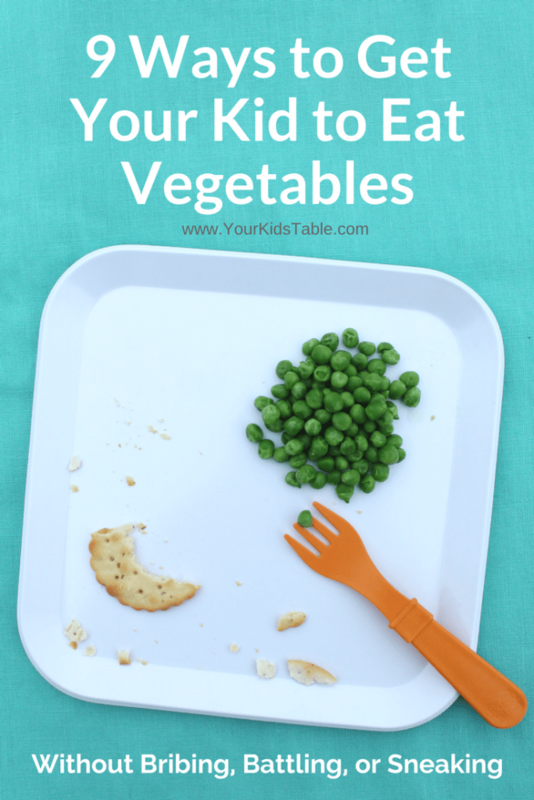 How to get your child to eat vegetables easily without the stress. 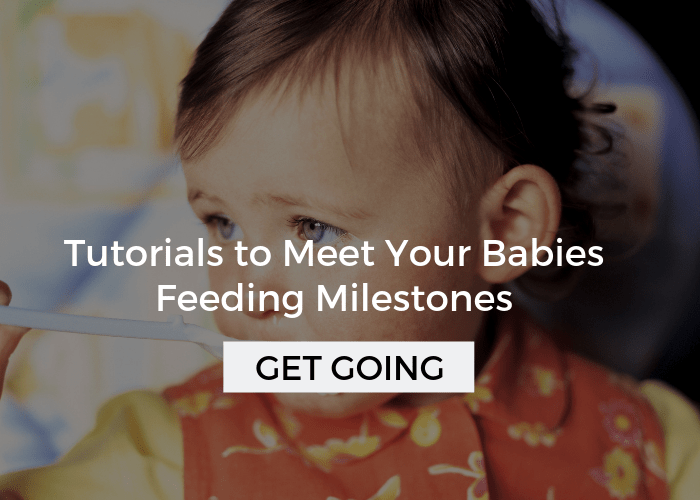 Find 9 of the best strategies and get vegetable recipes to inspire you and your child! 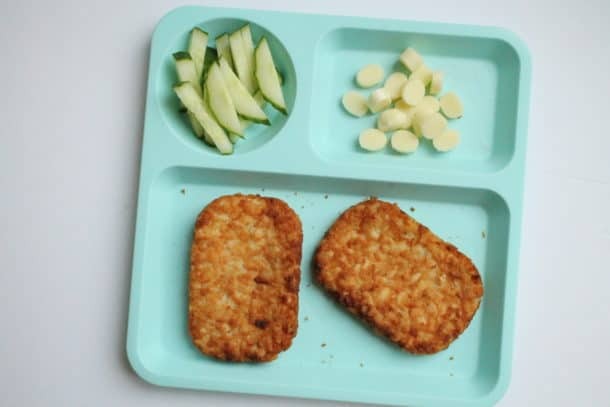 If I had a dollar for every time I heard, “My child won’t eat vegetables…” As a feeding therapist its a statement I’ve heard more times than I can count, and the truth is that children refusing to eat vegetables is about as common place as toddlers and tantrums. Of course, that doesn’t mean that you can’t teach your child to enjoy and actually like vegetables. In fact, I’m going to give you my best tips and strategies for how to get YOUR child to eat vegetables. 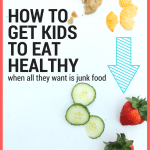 I’m going to spare you the details on why veggies are such an important part of your kid’s diet – most of you already know that, and its probably what brought you here in the first place. I’m also going to admit up front that this is an area that we are always working on in my house. Isaac, my 2 year old picky eater, only eats raw carrots readily. However, last week he happily ate spaghetti squash, which is usually something he totally avoids, because I used the strategies below. My point is, there is hope! And, if you want some specific vegetable recipes for kids, well, I’ve got a boatload for you in that link! The important thing is that we need to get them comfortable with vegetables, because honestly they’re fairly foreign to them. As with any food that they don’t prefer, what they really need is a chance to explore it when the pressure to eat it is off. So while veggies are important, I don’t want you to put pressure on yourself or your child to eat them, and if you need to ease your worrying parent conscience (oh, and I get that) than reading about what your child’s nutritional actually are here will be really helpful. I can almost promise you that you’ll be surprised! 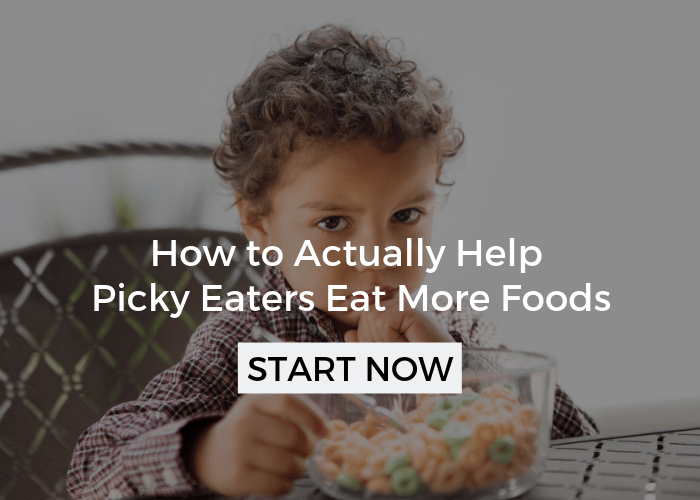 Let’s dive into specific tricks (although I’m not a fan of hiding vegetables) and tips for how to get your child to actually eat vegetables. Make sure you give them a go multiple times before throwing in the towel, often times kids need a lot of consistency and repetition. 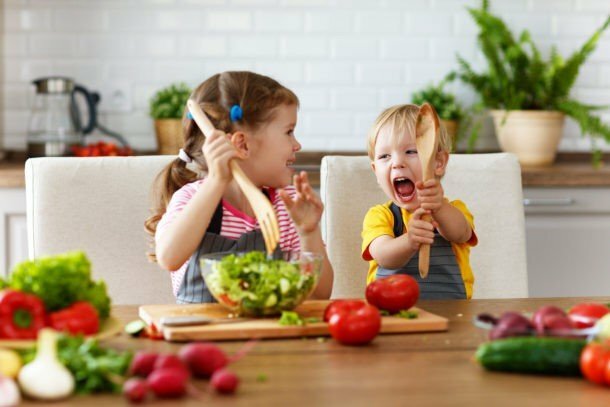 And, of course, remember to act casual and make it fun – that may be the biggest key to actually getting toddlers and kids to eat vegetables! 1. Serve veggies raw (carrots, zucchini, green beans, celery, etc.) with a preferred dip like ranch, peanut butter, sour cream, etc. Obviously, there are some choking hazards with the toddler crowd, so be careful of raw carrot and celery. Some kids like the crunchy texture much better than cooked and dipping is usually a win with kids. Plus, dips help mask the sometimes strong taste for kids. Yes, we want them to be able to eat them plain, but this will help get them there. Don’t hesitate to try this with a hot meal that you wouldn’t normally pair it with. By the way raw veggies pack the most nutrition. Read more about how to use dips in your healthy eating arsenal. 2. Serve frozen vegetables frozen. I know that sounds crazy, but it really changes the taste. A lot of kids think it is silly and are likely to give it a go. Peas work really well for this one and I would try it as a snack. 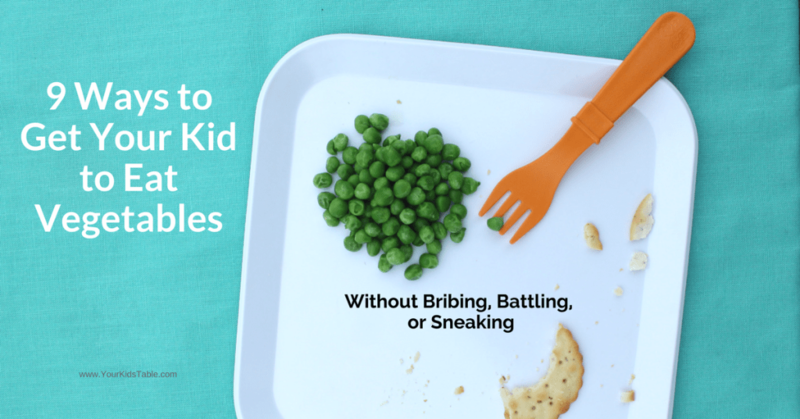 I’ve watched my picky eater over the years eat frozen peas on multiple occasions, especially when combined with tip #4. 3. (I can’t say this one enough,) cook with your kid. In particular, have them prepare the veggies. Tear lettuce, cut up cook carrots, peel a cucumber, whatever is appropriate and safe for their age. It could be as simple as mixing some seasoning on top or placing the veggies into a bowl. 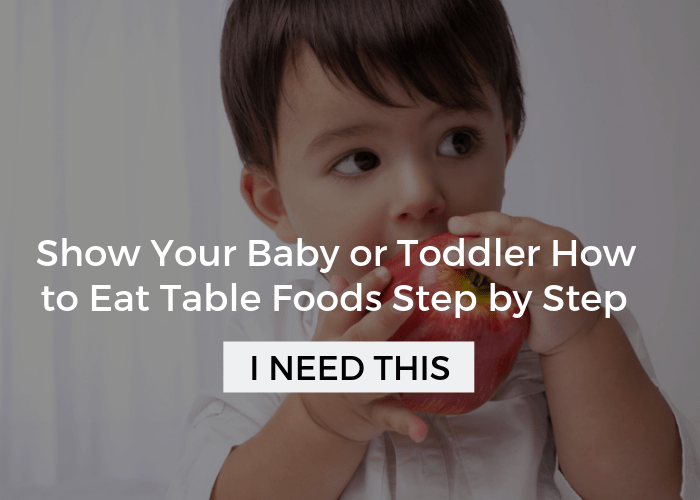 Take a few bites while your cooking and casually suggest that your kid try a bite. Maybe they’ll surprise you! 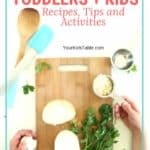 Read more about how and why to cook with your kids. 4. Have the veggies ready first! As soon as I start to cook (if my kids aren’t helping), they start hovering like bees around the hive. I put out the veggies we’ll be having with dinner anyways and they often gobble them up, well at least Sam will. Sometimes I even just set them on the cutting board. He’s helping me cook and snacking on veggies while he’s doing it. Isaac may actually eat a bite or two, but for him that’s great progress. You can read more about this strategy here. 5. 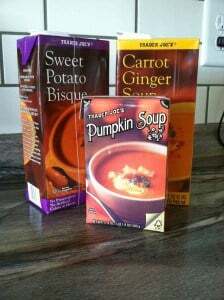 Use boxed pureed veggie soups like in the picture above. I love these, obviously I shop a lot at Trader Joe’s, but they are everywhere. 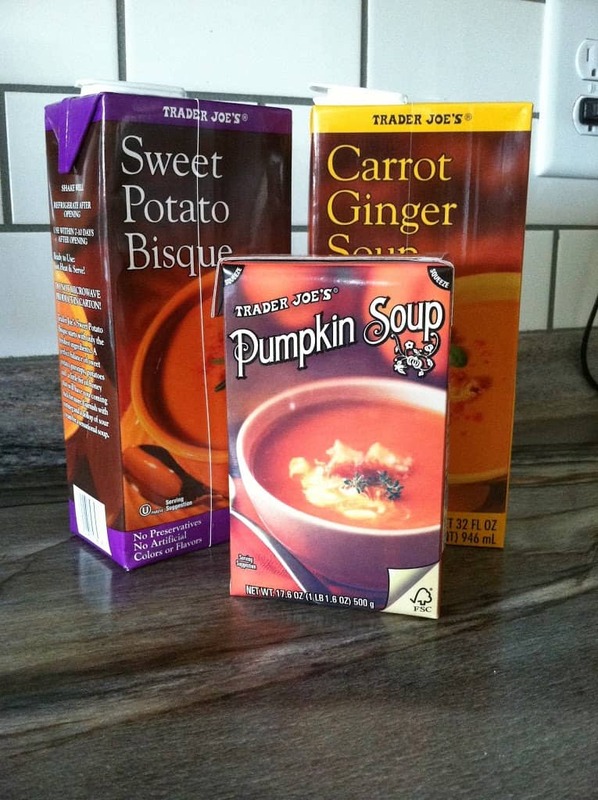 These soups are very thin, have very little texture, are low in calories and predominantly vegetable. I serve it as a side, both my kids love a wide variety of these. I also add milk or cheese to thicken it up and will pour it over noodles, rice, couscous, or barley as a sauce. They are also fantastic to use in casseroles and sauces like this hamburger casserole. 6. Consider size and quantity. Small pieces and a small amount are always the way to go. Kids can be overwhelmed with their eyes first and texture second. Biting or chewing through a little piece will help them explore the texture, which can be really different, before being overloaded by it. Spinach inside of ravioli is great, but if it is all spinach they may not go for it – at first anyways. 7. Mix the vegetables with something else. Yes, I know this can be a double edged sword. Many kids refuse casseroles and foods that are mixed together, but it is still worth a try. Besides, it is good for kids to see foods mixed together sometimes. Keep the veggie you’re mixing in small and don’t add too much on your first try. If possible, let your kid know in advance that you are mixing it all together or even better, cook it together. You can also remind your child that it is their choice to pick out the veggie, but this is how you are serving it for the family. However, I would only offer that up, if they seem to be getting stressed. If your child likes eggs, then this Made Your Way Quiche will be a perfect recipe to try! 8. Put veggies between or on some type of bread. For example, add veggies to the inside of a quesadilla, burrito, sandwich, or pita. The bread and other foods mixed with the veggies help to soften the strong tastes and different textures. Let me be clear though, the point isn’t to hide the veggie, in fact, I want you to point it out (casually) to your kid, if you haven’t already. Chances are they are going to detect it anyways and then feel like you were trying to dupe them. If they helped you cook, then they know it’s there and will be more comfortable with it. Ultimately, if they think you tricked them, they likely won’t eat it. Most kids love bread and bread products – if your’s doesn’t, than skip this tip. 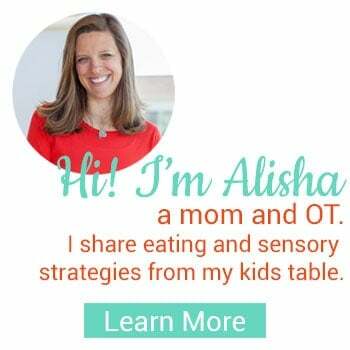 One of my favorite ways to use this tip is with a special bruschetta bar for kids, I know it sounds strange, but check it out because its super versatile and easy. 9. Serve vegetable muffins or breads. Think pumpkin, carrot, sweet potato or spinach. These muffins can be down right delicious and will often be seen as a special treat in the eyes of your child. Our family favorite recipe is this banana pumpkin bread, that also happens to be high-fiber and immune boosting! There you have it, some simple strategies you can try today to get more vegetables in your kid’s diet. Keep in mind that it is important to keep mealtimes and meal prep as positive as possible. 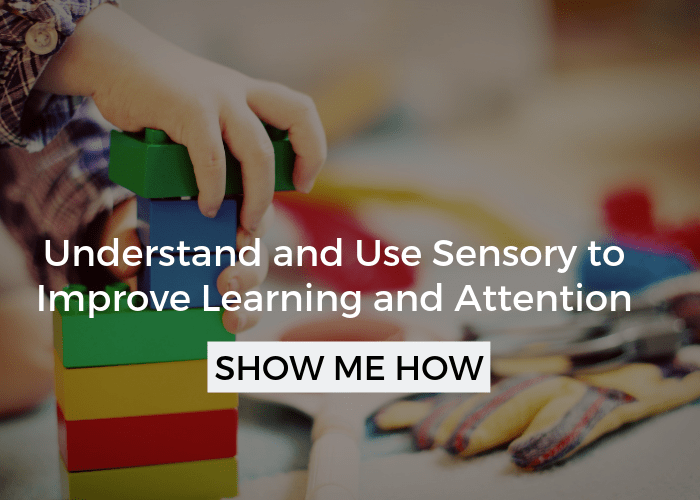 Stress levels can get high quick and your child will pick up on it. Avoid power struggles and focus on any new things your child may have done with the food like touching or smelling it. Before I go, here are some inspiring lists for vegetable recipes and ideas. I have had success putting my 2 yr old daughters food into a bag or putting a lid on it to catch her attention. She munches as she plays with the different serving method ( usually the frozen veggies!) and she liked the challenge of trying to get the thing open.